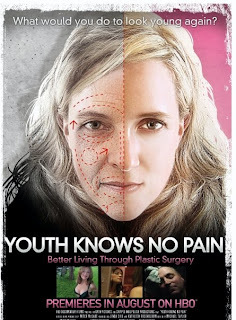 In YOUTH KNOWS NO PAIN, an age-obsessed daughter of a plastic surgeon (filmmaker Mitch McCabe) takes a journey through America's $60 billion a year anti-aging world. In this Alice-in-Wonderland tale, McCabe spends 2 years traveling across America visiting doctors, experts and lives with a cross-section of characters from Minnesota to Texas who've gone to varying lengths to "beat the clock", to paint a funny but troubling portrait of a country that desperately needs to stay forever young. Along the way, one wonders if the filmmaker herself hasn't been pulled in by the seduction of youth. "Youth Knows No Pain" is an alternately wry and unsettling journey across that grey zone where physical appearance meets self-esteem. Mitch McCabe has assembled for the film a remarkable group of individuals who collectively reveal that there's a deep discomfort running through the heart (and body) of contemporary America." I wish that the description of the film would have acknowledged that some people who seek out cosmetic procedures do not want to be "forever young", just more refreshed looking. But I'll agree that there does seem to be a pathological obsession with line free faces these days. Thanks for the heads up, looks very interesting. - Cinevegas film Festival Dates, June 10-15. "Youth Knows No Pain screens Saturday June 13, 6:30pm, and Sunday June 14, 10am. - Silverdocs Film Festival, D.C. area. Friday June 19, 3:30pm, Sunday June 21, 6:30pm. - Los Angeles: Sunset Gower Studios, June 30th, 7pm.